Before 1897 much of Worthen and Brockton was owned by the Kynaston estate. The Kynastons were not a local family. John Kynaston of Hardwick Hall, near Ellesmere, inherited the Worthen estate in 1797 from his relative, John Powell*. The Powells were a local family: they had acquired the Worthen manor from the Earl of Stafford in 1572 in lieu of debts which he owed them; they built Worthen Hall in about 1590 and built Hampton Hall in 1681-86. In 1737 and 1794 members of this family held the office of High Sheriff of Shropshire. 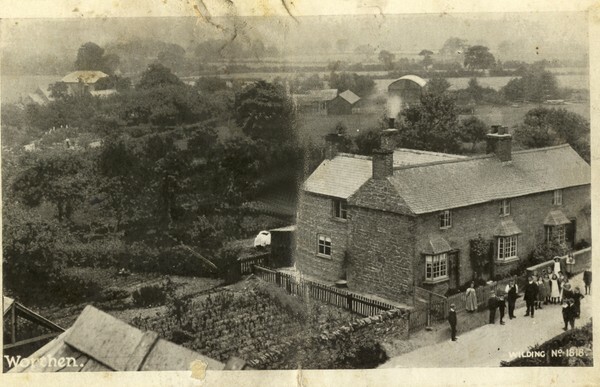 When the Worthen estate was broken up into lots and sold in 1897 these three cottages on Worthen bank were two cottages - for description of them and other lots in 1897 see Kynaston estate auction details at Shropshire Archives. They were then lived in by Horatio Jones and William Bland, the total annual rent income from them being £10 a year. In 1897 they were bought by Edwin Blakemore at the estate auction for £250, according to the auction report in the Wellington Journal. Sometime after 1901 they were converted into the three that you see. In 1911 the nearest cottage, number 25, was lived in by Ernest Humphries and his wife; the middle one, number 26, had Albert Rogers and his family; and the furthest, number 27, still had William Bland and his family. The date of the photo is approximate. By 1922 number 25 was being lived in by Edwin Blakemore himself, and 26 was occupied by his son Fred Blakemore and his family; William Bland was still in 27. In 1911 and 1922 all the cottages were technically owned by another son of Edwin's called Ernest Blakemore. The cottages have since become one single house. The buildings in the background are probably associated with Worthen mill. *John Kynaston was the son of John Powell's half sister, Mary, who had married Roger Kynaston in 1752. Under the terms of the transfer John Kynaston was required to change his name to John Kynaston Powell on inheriting the Worthen estate. He was MP for Shropshire from 1784 to 1822, and claimed, and tried to establish (unsuccessfully), that he was the true heir of Edward the last Lord Powys. In 1818 a baronetcy was created for him and he became the 1st Baronet of Hardwick and Worthen. This baronetcy became void on the death of the 3rd Baronet, John Roger Kynaston, in 1866.